Real-time re-sampling and linear interpolation? 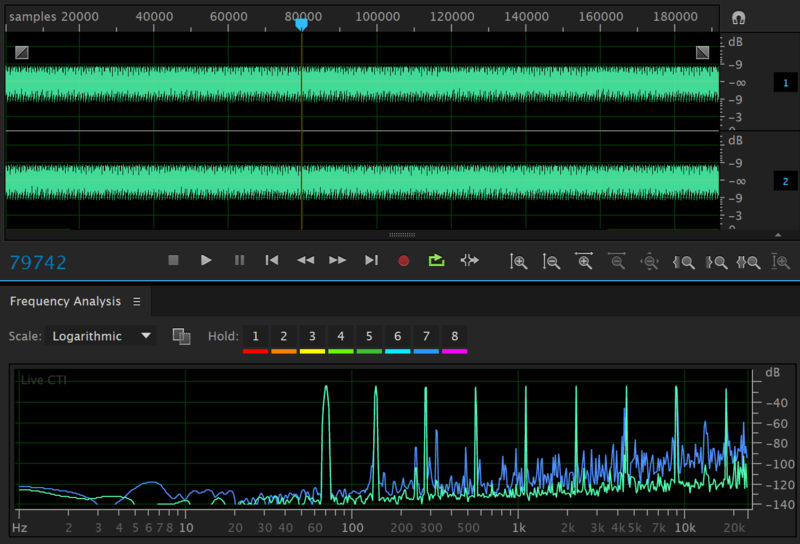 Disclaimer: I’ve intentionally tried to keep this post “non-mathy” – I want it to provide a high level overview of what linear interpolation does spectrally and provide some evidence as to why it’s probably not suited in audio processing… unless distortion is desirable. In the context of constant pitch shifting (the input and output signals have a fixed sampling rate), linear interpolation treats the discrete input signal as continuous by drawing straight lines between the discrete samples. The output signal is constructed by picking values at regular times. 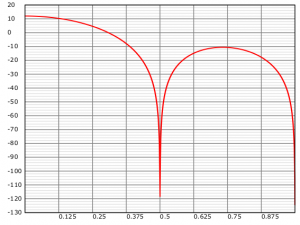 Audio data is real valued and real valued signals have a symmetric magnitude spectrum about DC (in an audio editor, you will only ever see one side, so you’ll just need to imagine that it has a symmetric reflection going from 0 to -pi (pi can be thought of as the Nyquist frequency of the audio i.e. 24 kHz for a 48 kHz input). Interpolators insert U-1 zeroes between each sample. This is analogous to shrinking the spectrum of the input by a factor U and concatenating U-1 copies of it. The copies of the spectrum are called “images”. i.e. Decimators drop D-1 samples for every input sample. This is analogous to expanding the spectrum by a factor D and wrapping the result on top of itself (there is also an attenuation by D, but I will not draw that). The parts of the spectrum which have been wrapped back onto itself are called “aliases”. i.e. 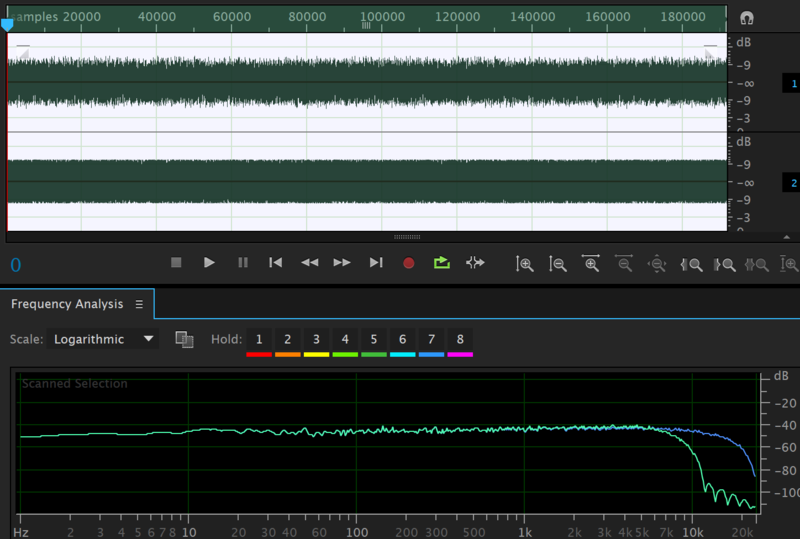 In audio, aliasing represents a distortion component which usually sounds dreadful. 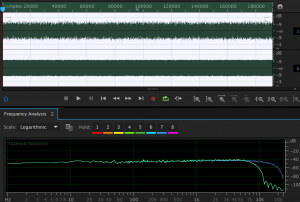 The only way to avoid the aliasing distortions is to ensure that the input signal is band-limited prior to decimation. 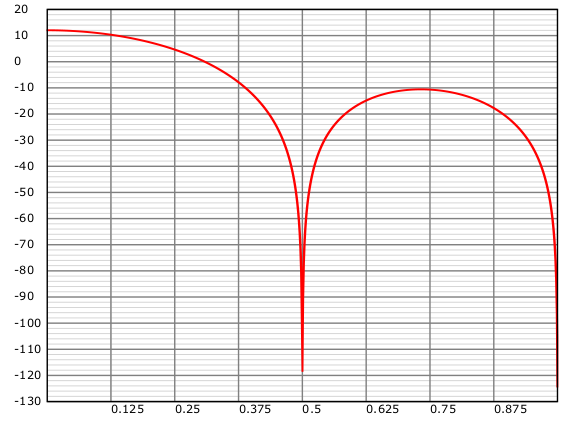 The H(z) block is a filter, this is a convolution applied to the samples that it sees with some other signal. It is analogous to multiplying the spectrum by some other shape. Linear interpolator response for up-sample factor of 4. This is not good – remember, we wanted the spectrum to preserve as much signal as possible for the first quarter of the spectrum and attenuate everything everywhere else. We can see that the worst case level of an imaging component will be about 6 dB below the signal level. It’s worth mentioning here that the problem does not get any better for higher values of U. The linear interpolator with two additional FIR filters. 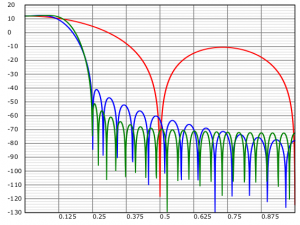 The blue and green responses correspond to 8*U and 12*U length FIR filters respectively. These are both reasonably longer than the linear interpolator which has a filter of length 2*U. The way these filters were designed is outside the scope of this article. 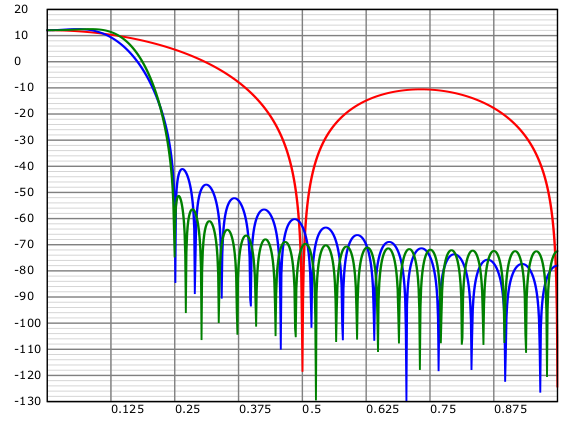 The red linear interpolator response costs two multiplies per sample to run, the blue costs eight, the green costs twelve – so these filters show a tradeoff between filter quality and implementation complexity. Note that both the blue and green filters achieve at least 50 dB of aliasing rejection – but we pay for this in the passband performance. If the input were an audio signal sampled at 48 kHz, the frequencies between 0 and 24 kHz would map to the frequency range on the graph between 0 and 0.25 (as we are interpolating by a factor of 4). At 18 kHz, we are attenuating the signal by about 11 dB; at 21 kHz, we are attenuating by about 31 dB. There is an interesting question here as to whether this matters as the frequency is so high. We can get around this to a certain extent by pre-equalising our samples to give a subtle high-frequency boost – but that is an extra complexity in the sampling software. Really the only way to make the cutoff sharper is to use longer filters – and that’s not really an option if performance is important. 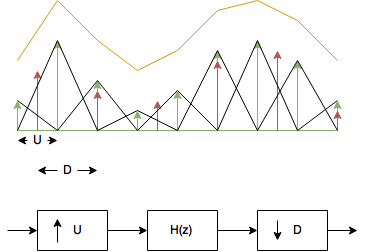 A white noise input being resampled using 8-tap polyphase filters (left) and linear interpolation (right). The input signal to the above output was white noise. Given that the input signal only had content from 0-24 kHz, we would expect that the output signal would only contain information from 0-12 kHz after halving the playback rate. We can see the linear interpolator has “created” a large amount of data in the high frequency region (all from badly attenuated images and aliasing). The “designed” filter attenuates the aliasing heavily but also attenuates some of the high frequency components of the input noise signal. 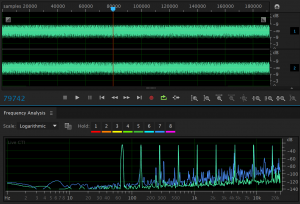 A complex tonal input being resampled using 8-tap polyphase filters (left) and linear interpolation (right). The input signal to the above output was a set of tones separated by octaves in frequency. The aliasing components of the spectrum have introduced inharmonic audible distortions in the linear interpolation case. The “designed” filter almost eliminates the distortion. Magic. I suppose this all comes down to complexity: two multiplies per output sample for linear interpolation vs. more-than-two for a different filter. I chose 8 and 12 for the taps per polyphase component in the examples on this page as I was able to get implementations of the re-sampler where the two sets of filter states (for stereo samples) were able to be stored completely in SSE registers on x64 – this greatly improves the performance of the FIR delay line operations. This entry was posted in Signal Processing and tagged Linear Interpolation on 1st November 2015 by nick. This page gives an outline of how to get your Windows Phone to sync calendars and contacts with an ownCloud instance running on a server using a self-signed certificate. This whole process is a hack and I’m incredibly disappointed that Windows Phone does not support this natively – especially since they have a CalDAV and CardDAV implementation already available (used by iCloud and Google accounts). If this process stops working at some point, that should be expected. I successfully got this working on a Lumia 735. I’m assuming that you’ve got ownCloud installed on a server using SSL. When the certificate was set up, the FQDN must really be the FDQN. i.e. if your ownCloud instance is hosted at “a.b.com”, the certificate must be for “a.b.com” – not “b.com”. I had this wrong on my home server and was getting the “80072F0D” error on the phone. If you have not yet set up ownCloud or have not set up SSL for your server yet, there are sites already documenting this process How to Create and Install an Apache Self Signed Certificate. You then need to get the certificate installed on your phone. If you do not do this, you will get errors when the phone tries to start syncing. You can do this by opening the certificate in Internet Explorer on the phone (you can do this easily by copying the certificate to your ownCloud files, logging into your cloud in IE on the phone and opening the file. You should then be able to follow the instructions here: Setting up CardDAV and CalDAV on Windows Phone 8.1. Create a fake iCloud account. Put garbage information in the fields and create it. The phone won’t check anything. This entry was posted in Uncategorized on 16th January 2015 by nick.